Warning: Use the information on this website on your own risk! What type of used LVT recorder do you want to buy? After the first introduction of the LVT film recorder Kodak made a number of improvements to the machine. Most of the changes affect the reliablity, speed, size, useability and production cost of the machine. They usualy had little effect on the color quality of the output. Some older LVT machines support output with 3048 (120pix/mm) instead of 2048 dpi (80pix/mm) or output up to 16x10". Since 2002 I have bought several machines (one new, four used) for myself and others. As I was never involved in the recorder business, the information provided here is simply based on what I have run into or the little I heard. I guess there are other people with far more knowledge on what type of LVT machines are out there. So take the information with care as it's likely incomplete or even wrong (infos are welcome). Rhino+ : This was the latest modell released. The machine comes in small 58x56x42cm (w x d x h) metal case and has to stand on a desk. Telling the Rhino+ and Rhino apart from seller images is sometimes not easy. They use the same case and sometimes you can't trust the label printed on the machine. 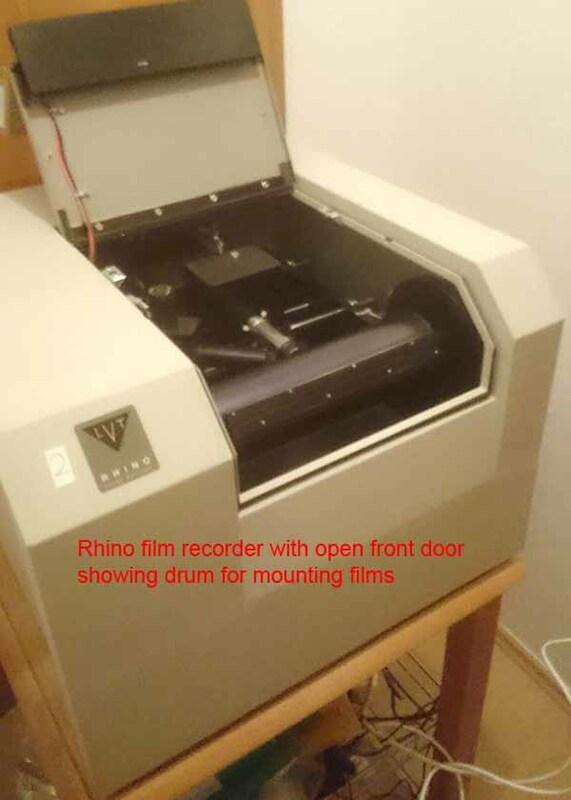 If you want to make sure you are dealing with a Rhino+, unscrew the bottom drawer at the back/bottom of the case and pull out the drawer with the electronics. The drawer simply slides out when you pull it. If there is a normal PC based motherboard, than you have a Rhino+. If you find a metal case with Digital Equipment (Dec) CPU board (the one with the terminal and AUI network port on board) you are dealing with the older Rhino recorder. The newer Rhino+ has some drawbacks compared to the older Rhino. I had severe problems getting the machine to work reliable. There were all sorts of problems (mainly software timeouts, lost material settings) with the software causing the machine to stop working and requiring a reboot. My impression is, that Kodak never really finished adjusting the software after moving from a Dec Alpha CPU to a 486 PC board. When Durst Dice took over from Kodak they didn't get the source code and thus were unable to fix the problem. The PC inside the Rhino+ does boot from a floppy disk (make sure you have a backup of the floppy disk as they might have a limited lifetime). As a floppy can't hold the complete operating software, the floppy disk only holds a minimal system. The main software is than loaded via FTP from a computer with an FTP server installed. This complicates the software installation. The Rhino+ comes with a faster twisted pair network interface. In practice this often is not really a big advantage over the older Rhino as you can start printing while the file transfer is still running nor was my Rhino+ far from fast enough in order to saturate the network. Rhino: The Rhino replaced the old LVT recorders and comes in a small desktop case 58x56x42cm (w x d x h). As Rhino and the new Rhino+ share the same case, you can easily tell if is a Rhino if the machine is connected via a BNC network cable. There are also Rhino recorders with twisted pair network. So only if the BNC connector is really used in the back, it is a Rhino. Otherwise you have to check the serial console output of the recorder during boot or open the back drawer of the recorder. I was told that the watchdog chip with it's battery on the DEC Alpha CPU board can cause the recorder to malfunction. The lifespan of that chip is reduced by the lack of cooling. While I never had problems with my Rhinos despite running them during warm summer, it might be wise to add a small fan that better cools the DEC Alpha board insde the metal case. I personal prefer the use of the Rhino over the Rhino+. So my recommendation is, buy a Rhino if you can, unless you want one of the older machines with 3048dpi or 16x10" output. LVT: With LVT I here basicly mean all the older LVTs that come in a large standalone case on rolls. As there are different versions and some of them being upgraded later on by a service guy, it's hard to tell them apart from the outside. If the LVT is controlled by an old VAX VMS computer instead of a Windows computer than you are dealing with one of the first machines. 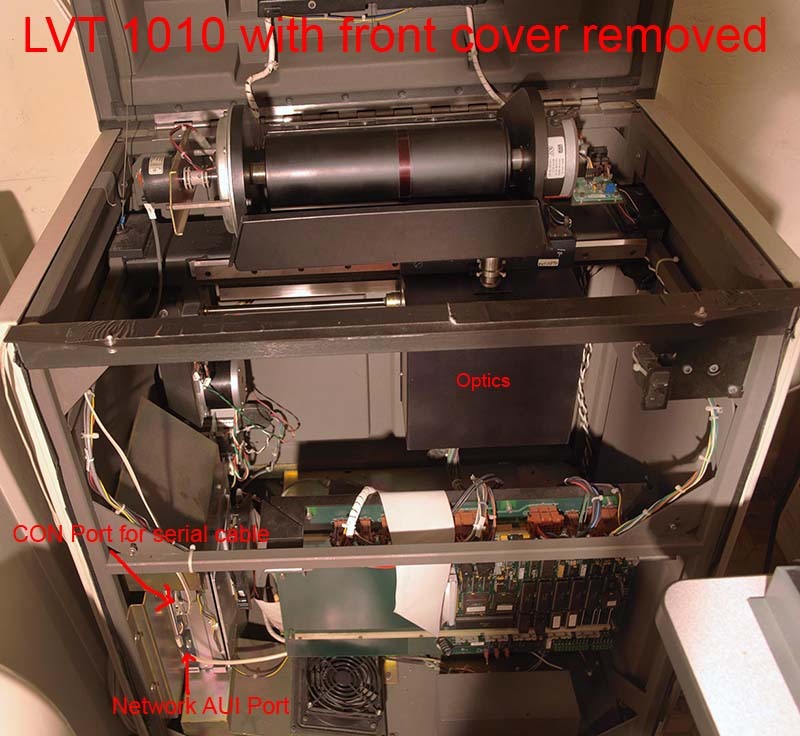 The VAX VMS computer is connected to the LVT using two large ribbon cables. So if you see these cables comming out of the LVTs back going to a VAX computer, you are dealing with this type of LVT. While I had one of them, I wouldn't recommend buying them anymore as the light sources are often rather weak now and thus the output slow. The printing can also be slow because the VAX software requires converting the TIFF images to a basic raw file first. A job that takes a second on modern computer, but minutes on the VAX. Note that the image format used by the VAX software is basicly the raw data without any additional information. Size and type of the image is saved separtly in a description file. So it's no bit problem writing a small tool so that you can convert the images on your PC before transfering it to the VAX avoiding the slow convertion using the VMS software. I will also not really cover the old Vax VMS based LVTs here in this guide, even though, some info found here might be usefull too. Newer LVTs do not come with a VAX VMS computer, instead you can print using Windows computer wich is connected by a network cable. Also they most likely have newer optics (NT head) with a stronger light source allowing faster output. In most cases, the software seems very similar to the newer Rhino devices. Be carefull when buying a LVT from a country with different voltage. The power supply does not support 110/220V autoswitching. So you need to take extra steps. With the exception of the very old LVTs, these machines work pretty reliable and thus are a good buy if you have the space for it. The only damage I had was a power supply that blew up leaving a room full smoke and a 4cm big hole inside the thick power supply layer board in the rear bottom left of the machine. Luckely the power supply was build by a manufacturer for various customers and a used industrial parts dealer in the US had a tested replacement in stock that was even a better revision with 220V autoswitching. There is often a US letter sized ring binder with a LVT instruction manual. Very important: The CD with the Windows operation software incl. the serial number printed on the CD. If there is no serial number, the CD might be a multimedia guide, test images or a product guide sometimes also included on CD. So make sure you get the Windows software incl. the serial number that must be entered during installation. In two cases I had issues with sellers claiming that all software was included and than the software was missing as the CDs included were not correct.one. All LVT recorders are different. You can spend pretty much time setting up the recorder for your specific film and processing. So try to get as much info from the previous owner on what the recorder was setup for/used with. Save yourself lot's of work by asking the seller if he has any info on the installed filter inside the machine and what material setup was used? Without this information you can easily spend many hours finding out what type of output materials the recorder was setup for. Any small information on the previous usage can help. If the previous users still has the software installled, ask for a copy of the Printer_1 directory found in the LVTUIS program directory. It usualy gives a good hint wich output materials the recorder was used with. In an ideal case the seller has the material sheet of his recorder (see this example of a material sheet) listing all the filters and material settings the recorder was setup for/with. The X-Rite densitometer used to calibrate the recorder was usualy sold separatly. Getting a used device on ebay can still take some time as they are often not sold cheaply. In case the X-Rite densitometer is included/bought, make sure you also get the calibration tile for the densitometer as this is often easily forgotten by the seller. Usualy there should be a network cable connecting the recorder with the PC. In half the cases I also got the serial cable for connecting the recorder with the PC (often the serial cable looks more like a typical western telephone line) from the previous owner. Transportation: The way the mechanics are build is different on the Rhino and Rhino+ compared to the older more solid LVTs. I strongly recommend transporting the Rhino or Rhino+ on a flat and solid base (strap it onto a pallet). If you cause tension/bend the case during transport, the optical head might get stuck more often during recording (also happens if you do not have proper oil or the metal bar the head moves on is damaged). The Rhino and Rhino+ recorders usualy are placed on a desk. Considering the high weight of the recorder and the rotating drum the desk should be build rather solid. However, I personaly prefer butcher/kitchen tables. Butcher tables often have rolls so that you can move the recorder to a storage room when not used. Also they are well made and have no problems handling the weight of the recorder. Another benefit is, that the butcher tables are sometimes higher than a normal desk making the mounting of films on the drum easier. The image at the top of this site shows one of my Rhinos on a (partly visible) butcher table from a Flamme furniture shop. The table size perfectly fits the Rhino. In order to quickly mount films I use a Light Safe box from Jessops placed on the top of the recorder to store films. As the box allows sizes up to 16x12" you can place two piles of 8x10" films inside one box. One pile for unexposed and one for exposed films. The box can be easily and quickly opened with one hand in total darkness. Pretty much ideal when placed on top of the Rhino or Rhino+. You need two rooms for operating the recorder. At least one (temporary) dark room for the recorder and a separate daylight room for the PC controlling the recorder. If you have the two rooms and no problems connecting them with network and serial cables, go ahead. I personaly prefer avoiding installing cables to connect both rooms. You can connect the recorder with your PC using a WLAN or powerline bridge. Just make sure that the brigde does transmit broadcast packages (most do). Also make sure the connection works reliable. I personaly have used the Devolo dLAN 200 AVsmart+ adapters as they work reliable and they come without any light source that you do not want in your dark room nor do you need an additional power outlet. When using WLAN instead of powerline finding a WLAN bridge that really works 100% reliable is a bit more demanding. I personaly have used the AVM FRITZ!WLAN Repeater 1750E repeater. Based on reviews and own experience the repeater does not interupt any transfers even when they take hours or days and the repeater supports 2.4 and 5GHz in case one frequency is already fully used by other WLAN users. I have also used the 300E instead of 1750E in the past with very good results. Most of the used machines I bought haven't seen any oil in many years when they arrived. 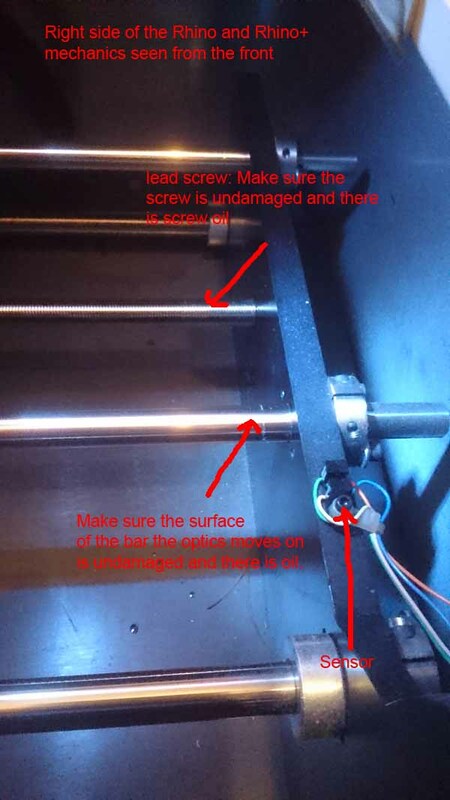 So before causing damages and making a first print, make sure you have oiled the machine properly (just a very small amount is needed). 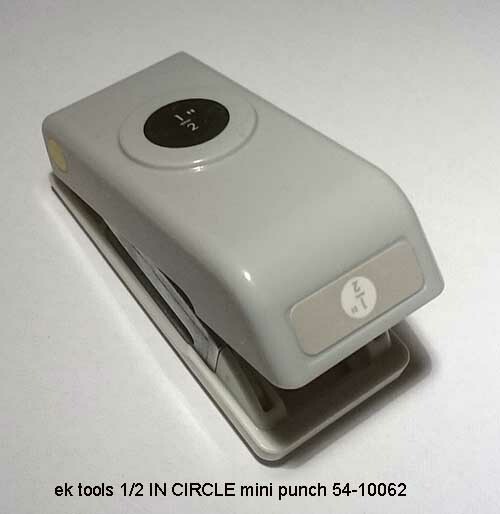 As described in the LVT instruction manual the recorder has an network ip address of 150.102.200.150 and should be connected to a dedicated network card inside the PC. This can be a problem, if your network installed in your darkroom already is based on a different subnet and you want to use the existing network. It can also be a problem if you can not or do not want to use a second network card for instance because you want to use a Windows tablet or notebook to run the LVT software. Or you might want to use different PCs to control the recorder. In this case you can change the ip address of the recorder to something you like and use your existing network without requiring a dedicated second network card in your PC. The details on changing the recorders IP address can be found below in the section Using the Serial Console and Configuration Menu. Older LVT and Rhino recorders use a 10MBit BNC network cable for connecting with a PC. BNC based networks and hardware have become rare as most networks are now based on twisted pair cables. You can easily change the BNC transceiver found inside the recorder to a twisted pair version. Some of the used recorders I got were already switched to twisted pair by the previous owner. For instance a CentreCom 210TS twisted pair transceiver can be bought rather cheaply on ebay. Open the recorder and look for the BNC transceiver usualy found near the BNC connector at the back of the recorder. The transceiver is usualy a box directly connected to the BNC port. Your recorder might use a transceiver from a different manufacturer. In the image below it is from MiLAN. Remove the network cable from the AUI port of the transceiver and connect it to the new twisted pair transceiver. Connect your twisted pair network cable with the transceiver and use a hole in the back of the case to get it out. Try to fixate the cable so that pulling the cable doesn't cause any problems inside the recorder. Usualy this is all that you need to do to switch to twisted pair. Use black isolation tape to cover the leds on the transceiver (was removed for the photo below). On older LVT recorders things are rather similar to the above image. Just search for the transceiver box connected to the BNC port. WARNING: Once you finished installing the recorder hard- and software, be aware that printing might still not be possible until you have setup the photomaterials.txt file correctly. A fresh installation of the LVT Windows software will install a default photomaterials.txt listing the available materials for the software wich likely does not match your recorders internal material setup. As noted above, try to get as much info from the previous owners material setup and if you are lucky you might be able to print... otherwise you need to check and setup the materials settings first. But more on this later in photomaterials section below. If your machine doesn't work or the first print causes a fuse to blow, do not panic or do something stupid. Try to get as much details about what happened as possible (logging as described in the next section was on? What exactly happened and when? Did you smell something?...). Have a look at the hardware if there is something wrong or visible. Check out the section Errors and Repairs . And before you try something stupid that makes things worse, take a day off and/or maybe get help. At least the recorders with a DEC AXP board (Rhino, older LVT with NT head?) do have DEC MMJ CON port beside the network AUI port that can be connected to a computer in order to display the recorders logging messages and also to enter the configuration menu that is usefull for changing the recorders IP address. I can't remember, but I guess there is also a serial port you can connect to on the 486 PC motherboard of the Rhino+ (most likely requires a null-modem serial cable for a PC connection). I have yet to see a Rhino with a serial port at the back of the case as described in the LVT instructional manual. Usualy there is just a whole in the back with the network/serial cable coming out (see the image below). The messages logged from the recorders CON port are also often the only way to tell what exactly is keeping your recorder from working. So I strongly recommend to always have your recorders serial port connected. Note while this documentation is for the Rhino, other versions of the older LVT recorders with DEC AXP board usualy have a similar MMJ CON or serial port for logging. Just look for it or check below images. 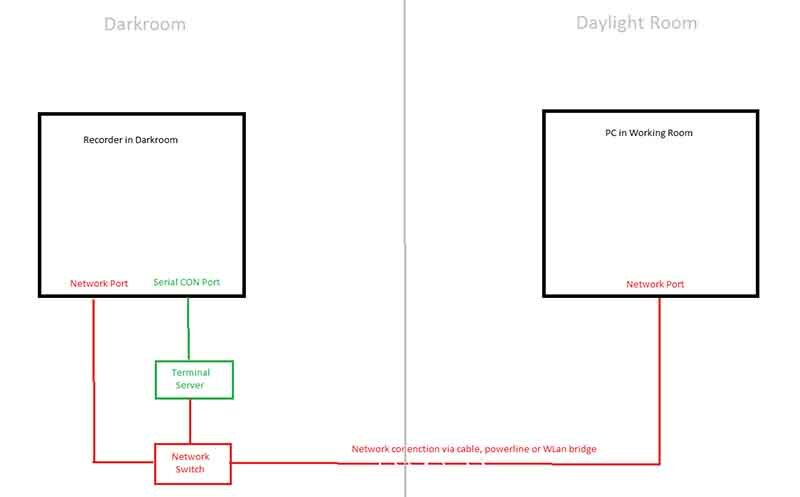 Often there is no serial port available on the modern computers nor do you want another serial cable from the recorders dark room to the room with the PC. In order to avoid having that extra serial connection to your PC you can use a cheap terminal server (Moxa N5150A, Moxa N5110A, Lantronix MMS1,....) to connect the recorders serial port to your network in the dark room. Than you can simply connect to the recorders serial port via the existing network from your PC. When connecting the recorder directly to a serial COM port on your PC you can also use the terminal software already shipped with Windows to display the recorder output. Note that the LVT software installs a "LVT Terminal" in the Windows start menu wich basicly calls the MS Windows terminal software and also provides a preset function key to enter systemlvt (read below). However, that terminal software has limited features and with terminal servers you definitly need TeraTerm or something similar able to connect via network instead of serial port or to allow simply starting the terminal software with logging on. I usualy recommend to install the free TeraTerm 2.3 software in order to connect to the recorder. But otherwise nearly any simply terminal software should do fine. WARNING: At least teraterm 4.65 doesn't really work here with the Rhino... so 2.3 is recommended. WARNING: Putty as alternative to TeraTerm does cause a reboot of my Rhino recorder when connecting. So would avoid Putty for now. The serial connection parameters are usualy 9600 Baud, 8N1 and XOn/XOff handshake. If you use a terminal server as recommended you need to setup the terminal server and you need to specify a telnet server port that you use to connect to the terminal server from your PC (on Lantronix ETS/MMS servers this tends to by port 300x with x being the serial port number used on the terminal server. On Moxa N5150A and Moxa N5110A you can easily configure the port number). So basicly all I need to do is click on that desktop icon in order to get a TeraTerm window connected to the terminal server with the recorders serial port connected. Please read the TeraTerm documentation on how to setup TeraTerm and for instance to automaticly start logging your sessions. Testing the connection: If everything is connected/configured correctly, you should see messages reported by the Rhino during boot, printing or also when simply starting the LVTUIS software. If not, check all your serial port settings and also the wiring of the used cable. An example of a complete log of a Rhino turning on/booting can be seen here. and than press return. The "Configuration Utility - Main Menu" should be dislayed allowing you for instance to change the IP address of the recorder. The current printer model is 1010. The default IP address 150.102.200.150 of the recorder is usualy not matching your inhouse network subnet. While you can use a separate network card in your computer for the recorder, this is often not ideal. So here I describe on how to change the recorders IP address on a recorder with DEC AXP board so that you can simply connect it to an existing network. The IP address on the Rhino+ most likely can't be changed that easy as the Rhino+ boots from a floppy disk and connects to a FTP server. So you need to make changes at least to the data on the floppy disk wich is most likely some work. Current network address is 150.102.200.150. Alter the ip address as wanted and after a reboot you should be able to output with your recorder. 6 This one is important. It selects the material setting saved inside the recorder for the output. The material settings are described later and they basicly provide some control over exposure time, filter used, aperture size, available print resolutions. RGB~TA these settings specify the densitometer measurements needed when you measure a calibration strip. WARNING! The recorder software remembers the entry number of the last photomaterial printed. When starting the LVTUIS software there must be a matching entry in photomaterials.txt or else the software will not start. So you can't simply add a material for tests at the end, do a test print and than remove that last entry in the photomaterials.txt file as this will cause the software not to start again. If this happens, simply add an entry again so that the software finds an entry at the start and do a test print with another material before removing the last entry again. After adding a new entry to the photomaterial.txt file you also need to add a matching .aim file in the config\Printer_1\aims directory. Aim files are used during calibration of the recorder. They basicly define what output density the recorder should provide for a specific R, G or B image value. Similar to the PhotoMaterials.txt entries there is only a small number of aim files provided with the LVT software and most of the films are hardly available anymore. Check out the LVT instruction manual for more info about the available aim files and what dmin/dmax they require from your film processing. Creating a new aim file for an unsupported film requires some knowledge if you want to get good and reliable results from your recorder. So usualy you can't simply use the aim file for Kodak EOF with a Provia 100F slide film or the Kodak TMax aim file with an Ilford FP4+. Even if you got an aim file for your material from someone, you at least need to make sure that your film processing reaches the density range required by the aim file. All photomaterials defined in the PhotoMaterials.txt file select a material setting saved inside the recorder. In the above entry 8X10EOF_V1195~POS~6~RGB~TA~ the material setting 6 is selected. The material settings can be accessed via the The monitor diagnostic menu . So when you got a used recorder and want to use 8X10EOF_V1195 you need to make sure that the recorders material 6 setting really is for Kodak EOF films and your E6 film processing is also working normaly. I am afraid, most used recorders I have seen have been modified and material 6 rarely was still setup for Kodak EOF films. WELCOME TO MONITOR DIAGNOSTICS. ENTER "HELP" FOR A LIST OF COMMANDS. 80= Print resolution in lines/mm this setting was made for. Note that the number of lines printed and line width can be controlled separatly. print resolution (or should I say the number of lines exposed per mm) and line width can be controlled separatly. 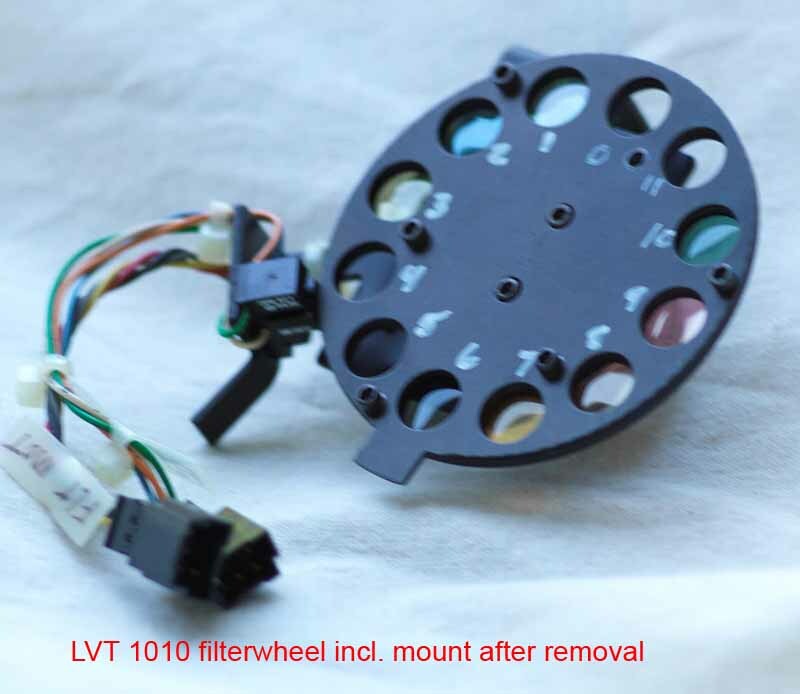 11= number of the filter used on the filterwheel (see Installing filters below). 15= drum speed (3-15 seems allowed). Basicly controls the exposure time. Note that the material 6 setting above has multiple entries for different print resolutions. So when printing photomaterial 8X10EOF_V1195 the print resolutions the material 6 entries listed above allow are 20,40 and 80 pix/mm. You can not have multiple entries with identical print resolution in one material number.You will fail if you try to print resolution 60 lines/mm even if the LVTUIS software allows you to select that resolution simply because there is no working material setting for it. It seems that on some recorders not all material numbers allow printing with all resolutions. So if you can't print and you are absolutly sure that all settings are correct, try saving your settings using a different material number. For prints 80 pix/mm at least material 5-9 seems to work on all recorders. When you got a recorder without any information from the previous owner about the material setup, it's usualy best you simply measure the installed filters using your densitometer and also keep a record of all material settings saved inside the recorder. Each LVT recorder is slightly different and as a result one recorder setup might not work with another. However you can often (not always) use another recorders setup as orientation and make a guess about what material settings are good for you. For instance take the settings from the material sheet example as orientational reference. 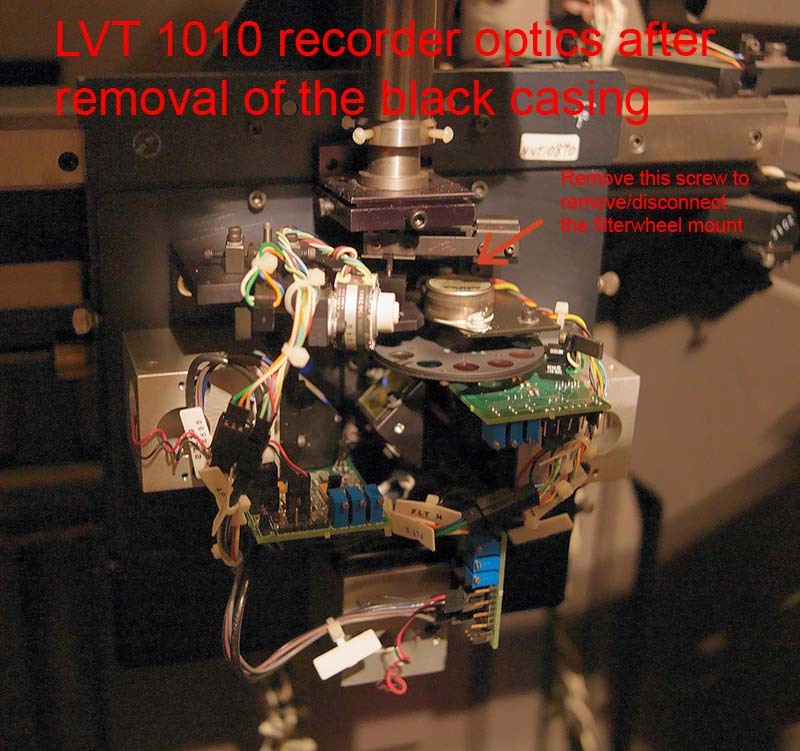 As described in the LVT instructional manual, when calibrating the film recorder for a given aim file, the calculated calibration LUT should result in output values of 100-400 at the low end, and 1800-3500 in the high end. Based on experience with my own calibration software I would rather recommend 150-400 at the low and 2000-3200 in the high end as there are otherwise visible problems you can run into when using a too low/high output value. The .dmp files written by the LVTUIS software during a successfull calibration does list the output values. So the job of the material setting and filter installed is to ensure that the output values are within an optimal range and maximum print speed. This requires an optimal color filter that balances the three colors. An additional neutral filter if needed and small adjustments to the drum speed should get the LUT output values in the wanted range. The neutral filter choosen should result in a drum speed close to the maximum of 15 in order to keep printing time low. When getting a recorder it usualy takes 2-5 films in order to find a material setting and filter that works. For a person without much experience and a recorder that requires changes to its material settings, this usualy means you might spend 2-3 days to setup the recorder the first time. It easily becomes a lot more if you have no idea what your doing or the used film processing is unstable/faulty. From my experience, half the pro E6 labs fail to provide a decent stable and correct film processing. The recorder uses filters to balance the color channels and to roughly control the amount of light used to expose a material. 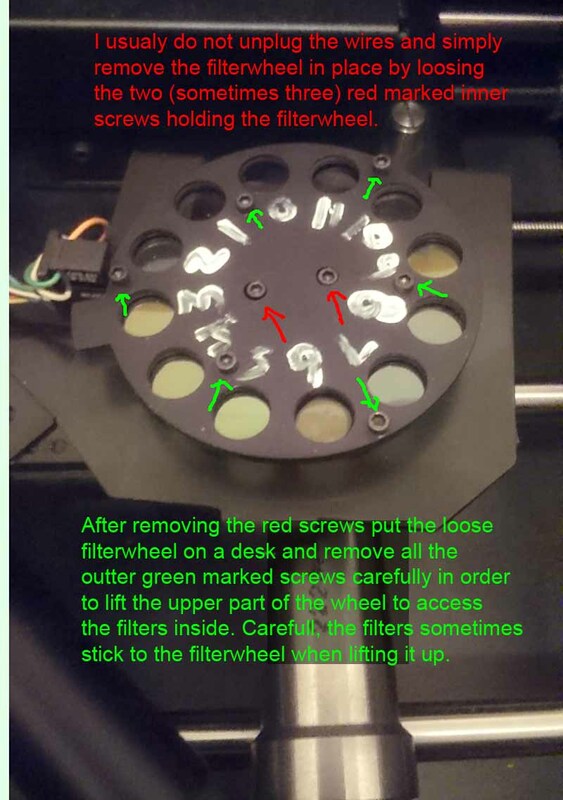 Depending on the exposed material and print resolution you might need different filters and thus a filterwheel with several different filters is used. The filters only offer a rough adjustment of the output. Additional settings like drum speed (= exposure time) and an output LUT allow a more precisse control of the colors. The images below show you how to access the filters. On the older larger LVT recorders things are only slightly different to the Rhino/Rhino+. Here you need to remove the black optics casing below the drum. Than you should be able to see the filterwheel incl. mounting as shown below. 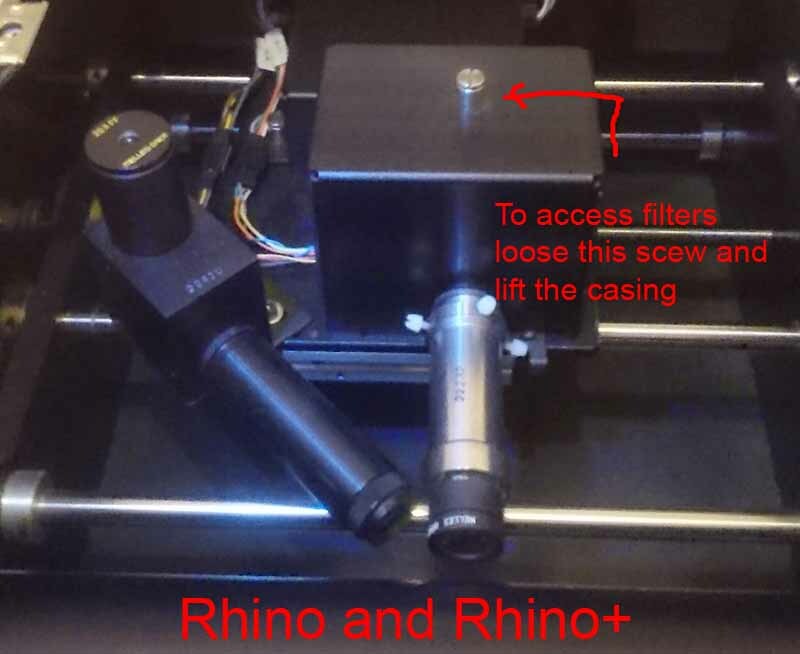 As the access is not as easy as on the Rhino/Rhino+ it is required to disconnect the cables for the filterwheel motor and sensor and remove the complete mounting. Note it seems common practice to not install any filter in position 0. This is for instance usefull for initial test with new materials. Keep a record of all installed filters, their densities and what they are used for. For instance use something similar to the material sheet to keep record. As described in the LVT instruction manual you basicly use the calibration software shipped with the LVT to fine adjust the color output. The LVT calibration software generates a LUT file wich translates the 8 Bit/channel image data to 12Bit/channel output values of the recorder. For calculating the LUT the software needs an aim file describing what output density should be printed for a given R,G or B image value and you need to print+measure a 26 step wedge. For this to work correctly, it is important that the LVT material setup and filters used allready do provide a decently correct output. If the material setup is rather wrong the LUT generated by the calibration software will not be able to compensate this fault. Also if the filters installed do not balance the R, G, B output decently, you might end up with Red being exposed correctly but lack exposure in the blues the LUT can not compensate. So a good material/filter setup is important for the calibration to work nicely as the calibration only offers limited but very accurate control over the output. When measuring the calibration wedge using an X-Rite densitometer I strongly recommend to warm up the densitometer by doing >10 measurements right before you start measuring the wedge. If you don't the X-Rite device will warm up during your measurement and might shift a small amount. As the human vision is very sensitive for certain faults in the gray axis there is little room for faults if you for instance want to output neutral grayscales. Before you perform a calibration always make a backup of your config\Printer_1 directory in the LVTUIS program directory. If something does not work well during calibration you can easily restore the backup and make another attempt. It actually makes sense to keep the backups from several last calibrations as they allow you to detect changes and problems over time. After each sucessfull calibration there will be a new .dmp file in config\Printer_1\dumps providing you important information about how the calibration went. The .dmp file is a textfile you can open in Notepad or a texteditor of your liking. It does list the used aim values, densities measured for the wedge, old and new output LUT values. Here you should always check if the newly generated LUT is not reaching bad values like 0 or 4095. The LVT calibration software uses an interpolation and not an approximation function on the measured calibration wedge data. This means, any small fault or noise in the measurement data will be fully reflected by the calculated LUT output function. So try to make sure your measurement are correct for instance by checking the .dmp file after calibration. Not a single measurement should be faulty or off. The LVT calibration software hates to extrapolate. If your aim file wants a density outside of the measured calibration wedge the generated LUT might not work well and at least another calibration update might be needed. This can be a rather serious problems in practice especialy if your film processing is not stable near DMin/Dmax. So a good and stable processing is important. The Excel sheet does not only graphicly show the LUT values. Identical LUT values reducing the number of shades printing per chanel are also visibly marked red. 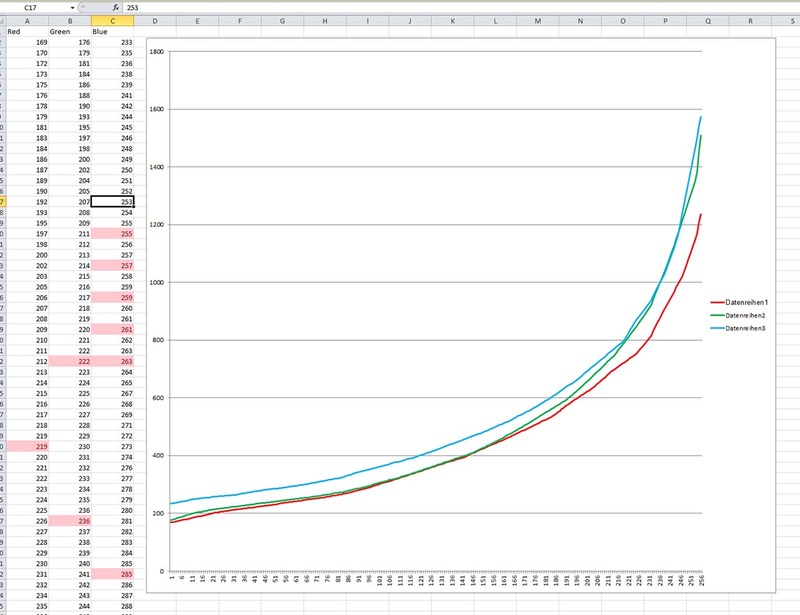 In the above Excel screenshot you see many red marked identical LUT entries because the exposure is still too strong resulting in rather low (<1600) output LUT values as indicated by the graphic. As noted in the photomaterials chapter above, the output values should at least reach 1800. I found that 2400 is more likely needed with slide films even with an optimal filter installed to avoid most/all identical LUT entries. The tools, Excel sheet and a short readme file as manual can be downloaded from here . Sorry: These are simple console based tools without any easy to use graphical frontend. So you need to use the Command Prompt in Windows. I simply didn't want to waste time on a GUI. Tools are provided here despite I think they are unlikely used by anyone. For those unable but wanting to use the tools, the .dmp textfiles generated by the LVT software during calibration also lists all values of a LUT file and you might be able to use them. Over the time I run into several minor problems with the recorder. Often the only way to get more info on the cause of the problem is logging the terminal output of the recorder (see Using the Serial Consoleand Configuration Menu). So I strongly recommend to connect the terminal output in order to log it, even if there is no problem. I once was only able to identify/fix the problem because the logging was on when the problem appeared. Do not panic or do something stupid. Try to get as much details about what happened as possible. What exactly happened and when? Did you smell something (hopefully just a blown fuse)? Have a look at the hardware if there is something wrong or visible? And before you try something stupid that makes things worse, take a rest.and maybe get help. At least the Rhino LVT software seems to not load TIFF images correctly saved with embedded ICC profiles. Only a black box appears when trying to load such images. So make sure that images do not have embedded ICC profiles. In case the LVTUIS software doesn't start anymore: This can happen if you did edit the photomaterials.txt file. The recorder software remembers the entry number of the last photomaterial printed. When starting the LVTUIS software there must be an matching entry in photomaterials.txt or else the software will not start. So you can't simply add a material to photomaterials.txt for tests at the end of the list, do a test print and than remove that last entry in the photomaterials.txt file as this will cause the software not to start again. If this happens, simply add an entry to photomaterials.txt again so that the software finds an entry matching the last print.. The front door for accessing the drum is controlled by two microswitches. One switch seems to basicly tell the the control computer when the door is closed and the second switch controls an emergency break so that the drum is immeaditly stopped when the door is opened during recording. Now these switches can stop working or they can become misaligned during transport of the recorder. It happened here several times that a machine didn't work after transport because the switches were not aligned correctly. In one case the printer did prompt error code 132 (optics head not home). In another case only the emergency break switch was misaligned leading the computer to start the drum for a record while the emergency break was still on causing a fuse on the circuit board controlling the motors to blow up (on the Rhino and Rhino+ the fuse is on the large circuit board on the left side of the machine. So you need to remove the cover on the left side for access). When the fuse blew up, there was smoke and a typical smell in the room and first I thought the damage of the newly arrived recorder was serious. The bad fuse was found quickly during checks and after sleeping one night, the cause with the misaligned switches came into my mind. Once the US fuse was replaced and the switch correctly positioned, I did a second attempt and the machine was working fine. So make sure that your switches are correctly positions and the front door changes the switches simultaniously. And as said, do not panic or try to force things. Sometimes it simply takes time to come up with an idea for the cause. 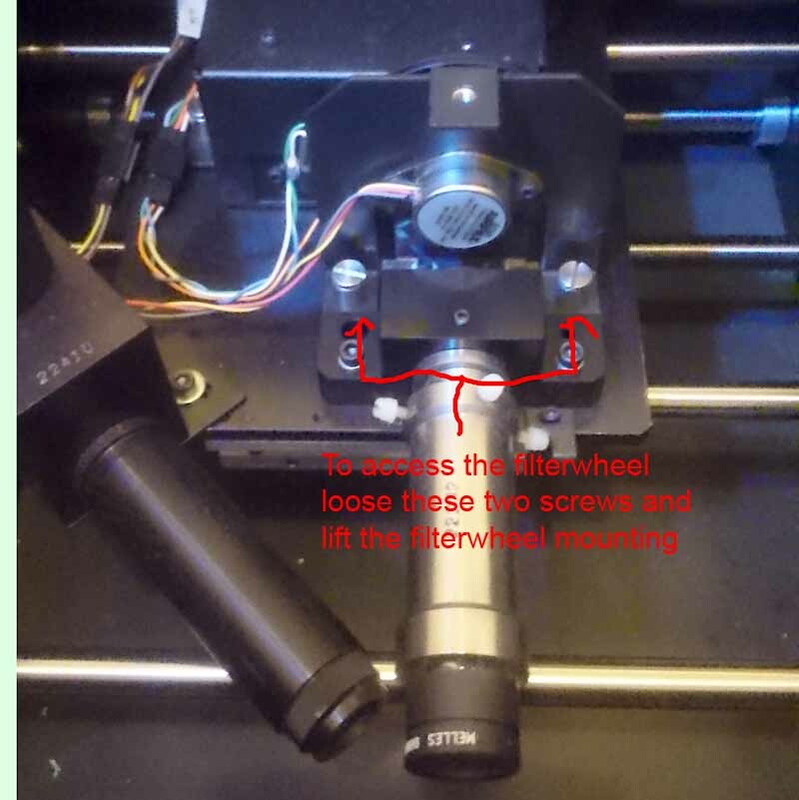 On all recorders I know it sometimes happens that the LVT printing software comes up with an error message reporting a problem with the optical head not reaching/being in it's right home position ~3-5 minutes after the print job was started (usualy error code 132). From my experience, if you properly applied oil to your machine and the recorder is fine, this error shows up only once in roughly 60 prints. Usualy the problem is solved by simply starting the print a second time. If you see this problem far too often or even always, check your machine: Do you use the correct oil? Especialy on the Rhino and Rhino+ check if the metal bar the optics is sliding on is still fine. Often the galvanisation is damaged especialy at the right side of the metal bar (see image below). You need to move the optics to the center or left in order to see the right side of the bar (you can use the command OPRN,LE,ST=300000 in the monitor diagnostic menu to move the optics to the center).. In one case, I had to slightly loose the metal bar and rotate it by 180 degrees so that the optics now slides on an undamaged area of the bar (DO NOT open all screws holding the machines together. It's most likely extremly hard without knowledge to tighten the scews again without causing problems with the machinics being misaligned... so just loose the scew very slightly holding the damaged metal bar the optics moves on and than try to rotate the bar by 180 degree). If you look closely at the surface of the right side of the bar in the image below there is a ring arround the bar roughly 1cm from the right margin. I found such a small damage to the surface of the bar on all Rhino/Rhino+ I have seen. As long as the damage is small as in the image and on the right edge, it is usualy no problem. Also check if the sensor shown in the image below is still fine? The older large LVTs are build more solid and there is no easily damaged galvanized layer on the metal bar the optics moves on. 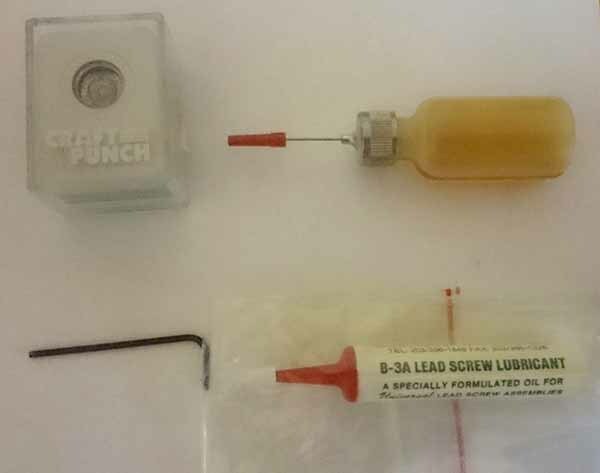 Here simply make sure the lead screw is still fine and oiled. Also make sure that the steel bar the optics moves on is fine and has oil. If the output shows stripes or lines in the fast direction (ie. a line that is recorded in one drum rotation), the optical head might not move correctly. The precission of the machines is pretty demanding. Especialy the old large LVTs are build rather well and it's pretty hard to break them as long as you properly oil them. On the Rhino and Rhino+ things can be a bit more tricky as the machines can become more easily misaligned causing the optical head to not sliding correctly resulting in lines/stripes in the output. See also the above note regarding the optical head not reaching the home position. The hard disk used inside the recorder for buffering the output image can stop working. Usualy detecting this problem can be a bit tricky as the hard disk might still work partly. If you are lucky, you get a good error message in the terminal log output of the recorder indicating the hard disk failure. Otherwise you can also move the drive to a PC and test it there (without writing to it!). On the LVT and Rhino with DEC AXP board you can simply replace the SCSI based hard disk with a similar modell. In order for the recorder to work, it seems you must fill the drives blocks with zero before installing it. So when buying a used harddisk, you likely also need a computer and software (a Linux Live CD like Knoppix is usualy fine... and than use sudo dd if=/dev/zero of=/dev/replacewithharddiskdevicename) to erase the SCSI drive before installing. The Rhino+ recorder seems to have a normal 486 PC motherboard.that does boot from a floppy disk inside the recorder. Make sure you have a backup of that floppy disk as floppy disks might stop working. The watchdog chip on the DEC AXP board (especialy in the Rhino casing) seems to die more early because of lack of cooling. The watchdog chip is soldered and thus it's replacing requires someone with the right soldering tools. In order to not run into this problem, it's best to add a small fan to the casing with the DEC AXP CPU board (you can use a Y-adapter fromt he hard disk drive to supply a small fan... do not use a power hungry fan). Unstable color output? Most recorders I had didn't need long to warm up in order to get a stable color output. However, one of my Rhinos can take up to two hours and the shift in color in those two hours is far from small. So I recommend that you turn up your recorder on a cold day and record a small wedge on the same film every 5 mins. After development check how long it took for the wedge output to become stable. Add a good safety margin and use that as minimum warm up time for your recorder. Otherwise the recorder is usualy very stable in color output and if you have problems getting stable colors in the output, you should rather check your film processing or films. Thanks goes to TC Reiner for providing the LVT 1010 images.